BENGALURU, India – March 9, 2017 – Corsair®, a world leader in enthusiast memory, high-performance gaming hardware and PC components, today announced its partnership with Team Brutality one among the top professional eSports organization in India. Brutality is an organization where friendship, loyalty and trust are the three important factors when it comes to gaming and that’s what we look out for in our sponsors. Our players compete in various national and international tournaments. While doing that the most important thing that they require is their gaming equipment such as mice, keyboards and headsets. 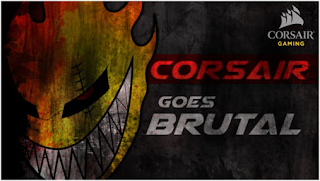 “Best Wishes to Team Brutality, with Corsair products in hand this association will take us to new heights. Corsair equipped gamers always have an edge over competitors and with Team Brutality we will make our footprints visible across the globe,” said, M.A. Mannan, Country Manager for India at Corsair. When it comes to choosing a weapon, our players make sure that they choose the best so that they can perform seamlessly. In order to do that we have partnered with one of the best computer peripherals companies in the world, Corsair. They share the same passion for gaming as us and after talking to them, we felt that they love working with gamers and want to know what is it that a professional gamer requires to enhance his performance. Their association with well-known gaming organizations along with their superior product line justifies this. “Whenever the name Corsair hits my system, the first few things that come to my mind are precision, stability and style. I have been a fan of Corsair since I made my first gaming pc. I remember putting in those Corsair Vengeance memory sticks on my motherboard with pride. I still have them with me and trust my words, they are still in great shape. Their iconic designs and innovative product line always peaks my interest. My second crush was Corsair’s RGB keyboards and headsets which I was eyeing for since quite some time now. I am very choosy that way when it comes to gaming equipment’s. When I play tournaments, there’s a lot at stake. I like my equipment’s to be steady, responsive and stylish; something that can take that extra pressure during tournaments and yet perform. My previous experiences have been pretty good with Corsair and that’s one of the reasons we decided to go ahead and join hands with this tech giant. Corsair products have beautiful designs and are very comfortable. There’s very less that I could add to this magnificent company’s success. Their products and users have already done it for them. We are just another few who are adding their experience to this protocol of satisfaction,” said Ankit ‘V3nom’ Panth, Founder of Team Brutality. Brutality is an Indian professional Esports organization that is a registered company with its CSGO squad. Formed by a team of aficionados of CSGO, the team gained recognition in the year 2010 at Chitkara bringing down the Goliaths of the game of that time. Team has just grown since then to become a leading face in the CSGO community in India with their reputation and stature preceding them. Brutality aspires to become one of the top teams in Asia and represent India and Asia both at the world stage with the same resonance that they and any other pro teams carries. At Brutality we always aim for the best and no matter what the situation is we deliver.